Recently a client asked me the following questions: What is Master Data Services? What is it for? And what has it to do with SQL Server? I answered as succinctly as I could. It then occurred to me that the answer would make a good blog posting, as others may well be asking themselves the same question. 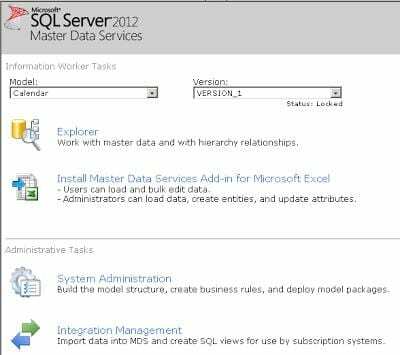 Master Data Services was first released with SQL Server 2008 R2. 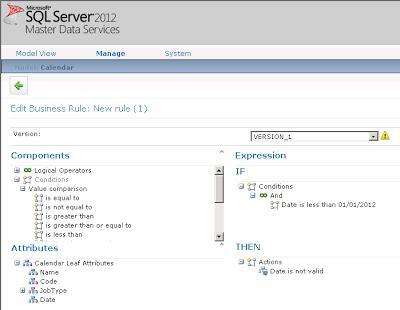 It is also part of SQL Server 2012, which adds some additional capabilities. Master Data Services (MDS) is managed central data repository. It defines data schemas, applies business rules to validate the data and provides interfaces for external systems to use the data. Important to note is that it is not just a data dictionary it also stores the actual data. Data can be versioned so that applications using the data can reference a particular version and are not forced to continually update to the latest version when the schema of the data changes. 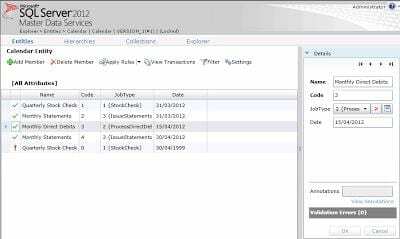 Entity and attribute definitions to define the schema for the calendar. A new Model called Calendar. This will hold the entity definitions and data. The JobType entity. This is a very simple entity that holds the Names of the types of jobs that are allowed: StockCheck, ProcessDirectDebits and IssueStatements. The Calendar Entity. Thus will consist primarily of a Name, Date and JobType. A business rule that prevents calendar entries before 01/01/2012. As well as the actual data in the entity, the view includes lots of other information, such as version number, entry date time, author, and so on. Note that not all of the fields are shown in the above screen for space reasons. Admittedly lots of details have been left out of this simple example including: security, web service interfaces, APIs, interfaces to Excel, data imports, versioning and so on. However, this information is readily available in the SQL Server Documentation and the MDS system as a whole is easy to use and manage. So if MDS provides a service that you need then it should be relatively easy to get started.